Once you've learned the basic climbing techniques, you are ready to begin combining them in ways that make different types of climbs possible. You'll soon discover the value of planning before you start up a new pitch. Always plan several moves ahead to help you conserve energy and stay on route. Identify and examine difficult sections before you get to them, make a plan, then move through them quickly. Look ahead for good rest spots. pure anything. You'll often use one technique with one hand, or one side of the body, and another technique with the other. You can be jamming with one side of the body as you use face holds with the other. A single pitch may require different techniques in sequence: a jam followed by a lieback, then face climbing followed by a mantel onto what had been a cling hold. 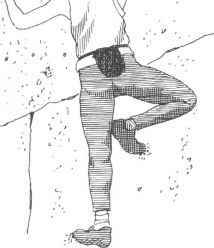 Basic techniques are combined in various ways for climbing faces, slabs, cracks, dihedrals, chimneys, and overhangs.